Who says men can’t pamper themselves? Well, much fewer than there was a decade ago, but there’s still a simmering attitude guys aren’t that concerned with self-care. Maybe it’s a leftover attitude from the masculinity-compensating mid-nineties to somewhere around 2010, or maybe it’s that most dudes don’t get yet realize the benefits. The male grooming industry is gaining momentum, with the best anti-aging creams, the best face masks, and the best manicure sets all popular among the modern man. The best foot spa is another option guys are exploring to help give them some much-needed me-time. A foot soak is perfect for relieving aches, pains, pressure, swelling, and soreness, and the at-home versions mean you need not feel embarrassed visiting somewhere public. Not that you should, anyway. Compact but powerful, relaxing but effective, a foot spa is what you need after a long day, week, or life on your feet. It’s perfect for athletes, construction workers, or just those of you who feel like treating yourself in front of the TV or a night on the Xbox, maybe with one of the manliest cocktails to put you into optimum relaxation mode. Our top pick for the best foot spa is the Ivation Foot Spa Massager which targets all problem areas around the feet and delivers a relaxing, rejuvenating experience for tired souls and soles. It’s effective for an hour or as little as 5 minutes, making it perfect for all needs, especially if you’re in a rush. The water treatment reaches temperatures of 122℉, which is the highest around if you can handle it, while multiple jets combine with bubbles to provide versatile functionality. The water takes a while to heat if you fill it straight for the cold faucet, but once it’s there, you’re guaranteed exquisite treatment without dealing with proper spa prices. If you’re on your feet for 12 hours a day, coming home to the wonders of this foot spa will help you make it through the week with ease, and also gives you something to look forward to after a long day. 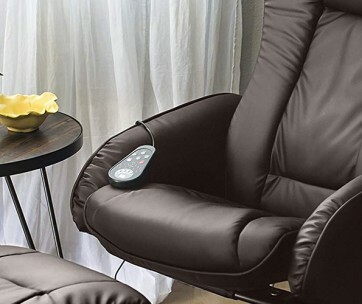 If you want to indulge yourself, check out our guide to the best massage chairs as well. Warm and luxurious, the Kendal All-In-One Foot Spa Bath Massager is a heated foot spa boasting everything you could need in your search for tranquility. It comes with rollers for further treatment, but you can remove them if they don’t do it for you, and this also ensures you can further submerge your feet into the basin. The semiconductor ensures consistent temperature because when you’re in you won’t want to get out, and its high-quality construction ensures durability, giving you a foot spa you can use every day without fail for years. However, the semiconductor is perhaps too good, and those sensitive to heat may not enjoy it as much as they should. The multiple modes provide versatility, and it’s also suitable for Epsom bath salts, giving you further options for treating your feet to just what they deserve, and you deserve, too. The Conair Active Life Waterfall Foot Spa is the ideal post-workout, post-run, post-hike choice around. It’s designed for those with active lifestyles and does everything it can to ensure you don’t miss out on your favorite activities just because of some pesky fatigue. With it, you’ll get 3 attachments, which you can use or not, we’re not the boss of you, while the LED showcase lights add something pretty cool to the whole experience, especially if you want to bathe your feet in the dark (you do you, bro). It offers a superb foot massage whether you need it every day or just once a week, and with the toe-touch buttons, you can operate it entirely hands-free. It’s not the largest around, but still enough for large feet, and its simple setup and operation mean your soak is as hassle-free as it should be. 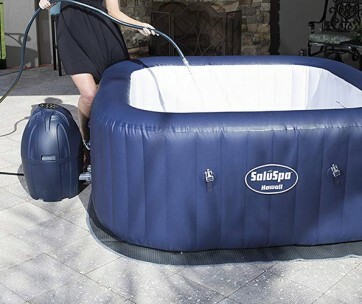 Our handy guide to the best inflatable hot tubs features more great products like this. Another choice if you’re looking for as many functions and features as possible, the Kendal All-in-One Large Safest Foot Spa Bath Massager offers versatility for a variety of treatment demands. Like other Kendal products, it comes with 3 preset programs, including bubble and waterfall features, which are supremely effective after a weary day.To protect your carpet or flooring, the splash cover is a welcome addition and prevents spillage when using it and the bubbles get a little too intense for your liking. However, it gets very hot, which won’t be for everybody, so be cautious when using it, especially for the first time. The basin is large to allow full-foot submersion, and it’s also easily portable, allowing you to attach casters to the base to move it safety if full. Two of these casters are also lockable, ensuring your further minimize the risk of spillage during your session. A simple and stylish foot bath (or at least as stylish as foot baths come), Dr. Scholl’s Invigorating Pedicure Foot Spa provides soothing treatment that’s perfect for runners, postmen, doctors, and nurses that can renew and revive tired feet with ease. It’s quiet enough so you’re not distracted by running motors, and it’s also easy to empty after a session. Also included is a 5-piece manicure set to add the finishing touches to your toes and ensure you’re not the target of curiosity and thinly veiled disgust next time you’re at the pool. The heating isn’t as reliable as other products, though, and the bubbles, while satisfactory, could be a little more aggressive. If you’re not concerned about bubbles, though, this won’t be an issue, and you can’t expect the spa to work literal magic. So it’s a decent way to soak your feet, but for the price there may be better options around. 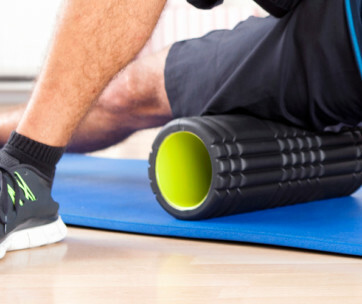 If you need a massage for your feet, check out our guide to the best foam rollers. Our premium pick is the Kendal All-in-One Motorized Foot Spa Bath Massager which is the product every foot spa enthusiast dreams of having. You’ll get everything you could ever need with it, including multiple massage options – a staple of Kendal products – along with a useful remote control. From here, you can set timers, change modes, and operate the foot spa with ease. There’s also a variety of useful features to draining, adding diffuser herbs for specific treatments, and a filter to ensure the water stays clean and effective. At 12 pounds, it’s the weightiest option around, which could hinder portability, but if you’ve already set up your relaxation room, this is the final piece of the puzzle to deliver unparalleled perfection to ensure you’re ready to run, walk, or skip wherever you go with total revitalized comfort. Make sure you also check our guide to the best foot massagers. With a variety of modes, the MaxKare Foot Spa/Bath Massager is a suitable choice for those looking for a simple-seeming but actually rather effective and plentiful foot spa. The LCD screen is easy to read, giving you information on water temperature, while the surrounding buttons make changing modes or upping the ante a breeze, even if you’ve got to lean down to reach them, oh poor you. Its intelligent water temperature also provides excellent control to find your optimum comfortable heat, but it may get a little too hot for some, so as always exercise caution if you’re not used to such temperatures. Even so, it heats well, and once you find your ideal temperature, it stays there throughout. For further treatment, the built-in salt compartments are useful for relaxing muscles, and the bubble systems are gentle without feeling too weird. For those who crave a special foot treatment wherever they go while also seeking excellent value, the HoMedics Compact Pro Spa Collapsible Foot Bath is the perfect option for them. It’s collapsibility makes it portable as heck while also being easy to store when at home. It’s large enough for most feet, and despite its construction, still holds water reliably, even when filled maybe a little too high. It boasts vibration massaging for reinvigorating, and the heat-maintenance system ensures a warmer and more soothing experience than many others at a similar price. It’s a little noisy, though, which could put you off, but you could put a thick rug or mat underneath it. We know it doesn’t boast the variety of features you’ll find in a more expensive foot soaking tub, but for value for money and a simple spa solution, there aren’t many better options out there, maybe none at all. Our final pick is the SmartHome Foot Spa which comes at a reasonable price for what it offers and combines a variety of foot treatments to ensure you’re never left exhausted on your feet again. These include hydrotherapy, Shiatsu massage, and soothing heat, which work together to provide a relaxing experience for everyone. This foot spa machine also provides consistent warmth, even with a large basin which is something that can cause the water to chill much more quickly. However, while the basin is large, it’s not as deep as other options, so if you’re looking for maximum submersion, there are better spas available. It’s easy to use, easy to store, and with a Heat Boost function, you’re guaranteed quick heating so you can be back from work and relaxed in just minutes after returning home. We didn’t have the luxury of testing out each home foot spa to drift us into a state of pure tranquility (and if we did, we don’t think we’d have gotten anything done for at least a week or two). Instead, we relied on different types of research to ensure we found the best options we’re sure will put you in a state of purest relaxation, zen, and as close to Nirvana than anyone’s ever achieved. Reviews - Foot bath massager reviews are crucial for letting us know all the things the product description neglects to tell us about. Through these reviews written by customers who have used the product personally (or at least had feedback from who they bought it for), we get to take a glimpse into what makes an awesome or not so awesome foot spa. This includes the comfort level, the depth and capacity of the unit, the ease of use, and how hot the water gets. If we saw one product had too many negative reviews, we had to cast it aside and look for something else. When we finished, we were sure we’d found a superb selection of foot spas and that’s (mostly) thanks to the marvels of reviews. Quality - High quality is an important factor no matter what you buy, and with home comfort and something designed to reduce aches and pains, you want certain quality. Building upon the information we learned from the reviews, we discerned the level of quality across a variety of products and this helped us not only make our selection but also rank them into best choice, best value, and the premium choice. To be considered high quality, we needed products which did not falter after the first use. We needed products that did what they were supposed to and actually felt like a massage treatment. These are products you want to use all the time, it’s just a shame you can’t, isn’t it? Before you decide on the best foot spa for you, check out these important features to make sure you’re picking the product you’ll get the most from. While some may look better than others at a glance, they may not be ideal for you and your home, so having one last look is essential. Heating - Nobody enjoys dipping their feet in tepid water, and much of the effect of a foot spa is lost if the water isn’t at or around a certain temperature. A heated spa is ideal for the best results, as it warms the water to your desired temperature without you needing to do anything separately. More advanced foot spas will use Smart Heat Technology, which works to maintain an optimum temperature during your spa session. This prevents you from sitting in water that gradually gets lukewarm and kind of gross, and ensures a successful spa bath to alleviate aches and pains, or simply treat yourself. Programs - Depending on your experience with foot spas, you may want one with multiple program options to find your favorite mode. While not all spas do this, those that do are popular if you want a variety of options to treat different foot issues. These programs help you target problem areas through ready-made systems making it easier to get the treatment and results you need. These programs are typically found on the interface hub and can be set with a single push of a button. If you’ve been advised to purchase a foot spa by a medical professional, they can often give you advice on how long to soak your feet for to fix any problems, too. Jets - Jets are another popular feature for a water foot massager, but they should be jets which do what’s intended. These jets should be powerful enough to provide an additional dimension to your soak, but not too powerful they cause discomfort, which will ruin the whole experience. That being said, the jets also shouldn’t feel like nothing more than two asthmatic worms coughing, and if this is the case with your foot spa, you may as well have just not bothered. Jets won’t solve all your foot problems, but when they work, you can’t deny how great they can feel, and if you love the jets on your jacuzzi, you’ll likely enjoy foot spa jets, too. Vibration - Vibration massage functions are found across all brands and ranges of foot spas. You can set the intensity of the vibrations to find which one works best for you, but be warned that vibrations that are too strong could cause spillage if the water level is too high. You can also combine the vibration with other features, such as heat and bubbles to find the perfect treatment for what your feet demand. Bubbles - A bubble function is perfect for stimulating the reflex zone. Much like full-sized jacuzzis, they also add to the whole relaxation thing you’re going for. Bubbles can be combined with a variety of other functions such as heat and vibration to find the optimum treatment for you. You’ll also be able to adapt how intense the bubbles are, which is useful if you’re a little more ticklish than the average person. They need not be on all the time either, so if you are ticklish, you won’t need to worry about them ruining the whole experience. Noise level - A foot spa that’s too noisy is a fast way to ruin the ambiance you’ve strived to achieve. While foot spas won’t be too noisy by themselves, it’s the extra features such as vibrations and other aspects which could affect the noise level. This may not be a problem for everybody, but if you have wooden floors or live on the second floor, you could cause disruption for both yourself and any neighbors living beneath you. 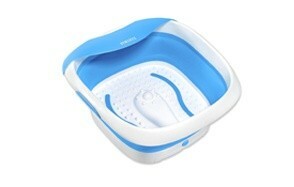 Above all, you want your foot spa to be as relaxing as possible, and too much noise could hinder this. Cord Length - A power cord is essential for an electric foot spa, but you must find a spa with a cord length that won’t make the experience awkward. Longer cord lengths allow for greater portability, allowing you to use your foot spa wherever, although it could cause a trip hazard. Shorter cords severely limit where you can use your foot spa, and if there’s not an outlet close to where you do your relaxing, you may struggle to reach peak treatment. You can always use an extension cord if need be. The cord should also be protected, as you don’t want any splashing water to damage the parts and circuits, which will break the unit and mean you can’t get the proper foot spa experience you crave. Storage - As much as you may want to, you won’t use your foot spa every minute of every hour of every day, so it’s important to consider where you’ll keep it when not in use. Compact foot spas make this easy, and collapsible options are even better for this. If you’ve got a lot of free space around the house, it should be easy enough to find somewhere to store it, but if not, you risk cluttering the home (something else that could impede your quest for relaxation) and also cause damage to the foot spa if someone trips over it. It would probably harm them, too. If you have a dedicated ‘you-room’, it’s wise to store it there, but if not, keeping it out of reach of children and anyone who wants to ruin your quest for relaxation and ache-free feet shouldn’t be too challenging.